This book is in celebration of Rineke Verbrugge's 50th birthday. It is a product of an incredible effort on the part of Rineke's teachers, colleagues, students and friends who have all been won over by her ever-encouraging and positive presence in academia and also in daily life. 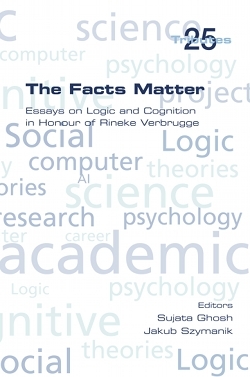 Pertaining to Rineke's research interests, the book features eight articles on a wide range of topics - from theories of arithmetic to a study on autism. The papers on hybrid logic, formal theories of belief, probability, goals, social networks, and bisimulations enrich the logic section of the book while papers on cognitive strategizing and social cognition bring up the cognitive perspective. The themes themselves provide a compelling perception of the vast expanse of Rineke's academic interests and endeavours. A series of personal comments, stories, anecdotes, and pictures constitute the latter part of the book, adding a distinct personal touch to this volume.